Looking for the best disposable diapers for your baby? Here’s my list of the top choices! It goes without saying that diapers will play a big role in your life once your baby is born. During the newborn stage alone, you’ll probably change 8-10 diapers a day! Thankfully, that slows down as your baby gets older, but you’ll still become an expert at changing diapers right out of the gate. Have you started thinking about what diapers you’ll use? Unfortunately, not all diapers are made the same and it’s important to look into the materials used in diapers, since diapers come in direct contact with your baby for prolonged periods of time. While disposable diapers are far from perfect, I am happy to report that there are several safer brands for you to choose from. What Chemicals Should You Avoid in Diapers? Can You Avoid Sodium Polyacrylate? What Are The Best Non-Toxic Disposable Diapers? Diaper manufacturers are not required to disclose all of their ingredients, and some companies won’t even tell you what is in their diapers. That’s a red flag that tells me that some diaper brands may contain even more harmful ingredients than we realize. ECF: elemental chlorine-free pulp. [Not recommended] You’ll now find diapers that are marketed using ECF pulp, which means that elemental chlorine is not used. However, the pulp is bleached with chlorine dioxide, which is a chlorine derivative and itself is a hazardous substance. This process reduces dioxins, but it believed that it does not fully eliminate them and simply that some testing mechanisms may not be able to detect their presence. Since the data is inconclusive, and chlorine dioxide is still a derivative of chlorine, I prefer to avoid ECF when possible. This process is safer than bleaching with elemental chlorine, but I do not recommend elemental chlorine-free diapers if and when there are better alternatives available. TCF: total chlorine-free pulp. TCF is a bleaching process that does not use chlorine or chlorine derivatives. It is a much safer process because it uses oxygen, peroxide, or ozone-based bleaching systems. These methods are safer than using chlorine because they do not generate dioxins. This is the safest bleaching method you’ll find being used in diapers at this time. Always look for TCF (total chlorine-free) pulp. NOTE: Don’t fall for technicalities or greenwashing. It is NOT enough for a company to call their diapers “chlorine-free” because they may be claiming that it does not contain elemental chlorine while it does contain chlorine dioxide. Always look for pulp that is TCF total chlorine-free. Sodium polyacrylate is believed to cause skin irritations, and may or may not be a health hazard. It is the same chemical found in tampons that was linked to Toxic Shock Syndrome in women in the 1980s, though this may have been because women left the tampons in too long and created a breeding ground for bacteria. Sadly, however, I have found that all disposable diapers contain some form of SAP, including eco-friendly and non-toxic diapers. Many also contain layers made with plastic that will also come in contact with your baby’s skin. If you are able to use cloth diapers, this is the best way to avoid SAP and plastic-based ingredients. Tributyltin. Another chemical found in many disposable diapers is tributyltin or TBT. This chemical is known to be extremely harmful to water life and may also cause skin problems in humans. VOCs. Disposable diapers commonly contain volatile organic compounds (VOCs), which are chemicals that have a high vapor pressure at room temperature. The VOCs commonly found in disposable diapers include such chemicals as toluene, ethylbenzene, and xylene. These chemicals can evaporate and cause impaired immune function and damage to the liver, kidneys, respiratory system, and lungs. Fragrances. Besides the chemicals mentioned above, fragrances, dyes, and plastics are all used in many disposable diaper brands. Anytime a company lists “fragrance” in their list of ingredients, it means they are not disclosing the full list of ingredients in their fragrance due to a loophole in the law that allows for the protection of trade secrets. This may contain phthalates, which are known endocrine disruptors. Using products that contain a nondescript “fragrance” puts your baby’s skin in direct contact with these chemicals and puts them at risk of rashes, allergic reactions, and other health hazards. While there is no perfect disposable diaper on the market, this list should provide enough reasons to forgo using mainstream diapers! And the best thing is that non-toxic diapers can be just as effective and absorbent as mainstream diapers. So, here is my list of the best non-toxic diapers. Because of the materials used, Andy Pandy diapers are naturally hypoallergenic and antibacterial, meaning they’re another great choice for babies with sensitive skin. The company has also confirmed that they do not use any GMO materials and their diapers have been tested to not contain heavy metals. Andy Pandy diapers are a great option for non-toxic disposable diapers. I have tried Andy Pandy diapers myself and was impressed with how soft and absorbent they are. And a lot of moms in my Facebook Group have also switched to these diapers and love them. They definitely get my recommendation! 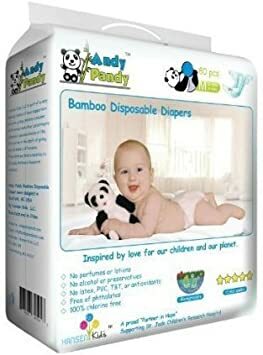 Andy Pandy Diapers Ingredients: 100% Non-woven bamboo fiber for our top sheet and back sheets. This is going to be directly in contact with your baby’s skin and we assure you that there has been no use of harmful chemical pesticides to treat the bamboo. TCF (Totally Chlorine Free) Fluff Pulp Sumitomo SAP Pure aloe essence (just a light mist on inner layer to provide nourishment to baby’s skin) Elastic in the waistband and around the legs Velcro tape Adhesive PH Strip (Wetness Indicator). You can shop these diapers on Amazon or subscribe via the company’s website for an added savings (take 10% off your entire first order with code TGN10). 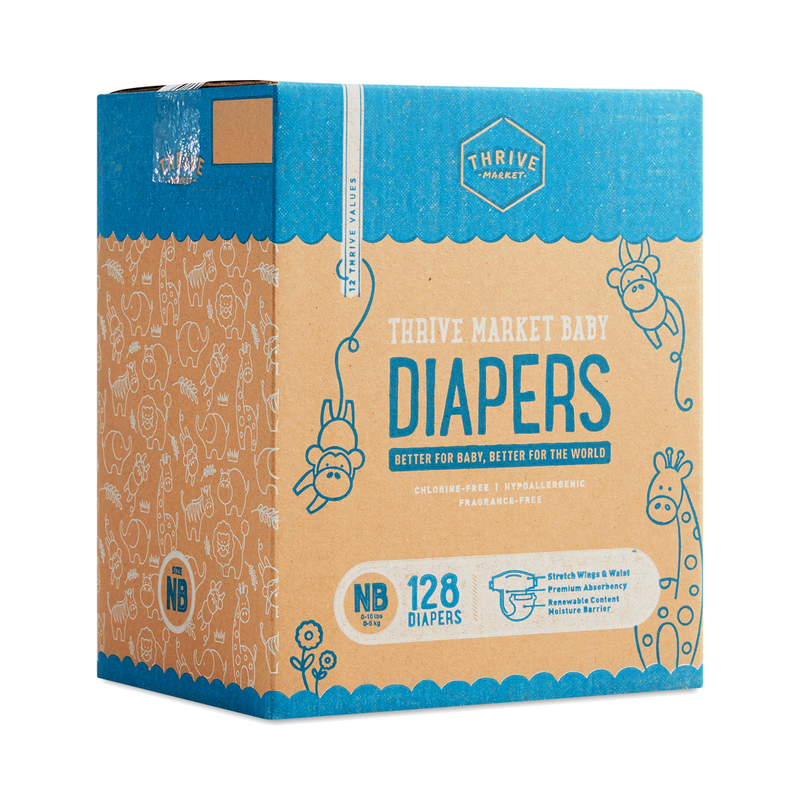 Though I don’t use many Honest Company baby products, I believe their diapers are among some of the best disposables available. They are well made, use mostly good materials, and very absorbent. Their super-absorbent core is made from ECF fluff pulp that was harvested from sustainably managed forests. Their diapers are made without fragrances and lotions, but they do use citrus extract and liquid chlorophyll as odor inhibitors. Honest Company diapers were reformulated in 2018, and now the inner layer is made from polyethylene and polypropylene, which is unfortunate since they previously used a plant-based PLA inner layer. So, please note that your baby will come in direct contact with these plastic-based materials. However, some sellers on Amazon are reportedly still selling Honest Company’s old formulation diapers, though it is not guaranteed that you will receive the old diapers when you order. There have been a number of reviews that claim the diapers tend to leak, but Honest Diapers have a huge following and I know many families that are very happy with them. We personally use their toddler training pants and have had a great experience with them. 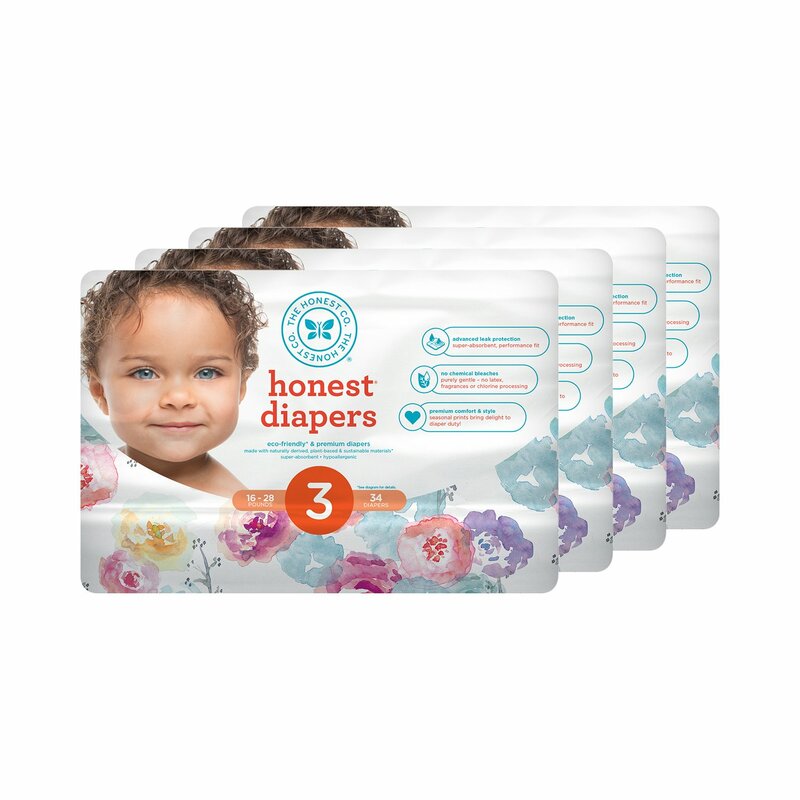 Honest Company diapers are manufactured in Mexico. Naty by Nature Babycare Diapers are also a great pick when you’re looking for natural diapers because they contain no phthalates, organotins (MBT, DBT, TBT), allergens, carcinogens, heavy metals, chlorine, formaldehyde, colophonium, dyes, PVC, GMOs, dioxins, or any substances known to be harmful. Naty diapers also don’t have any fragrances or perfumes so you don’t need to worry about skin reactions caused by questionable fragrance ingredients. 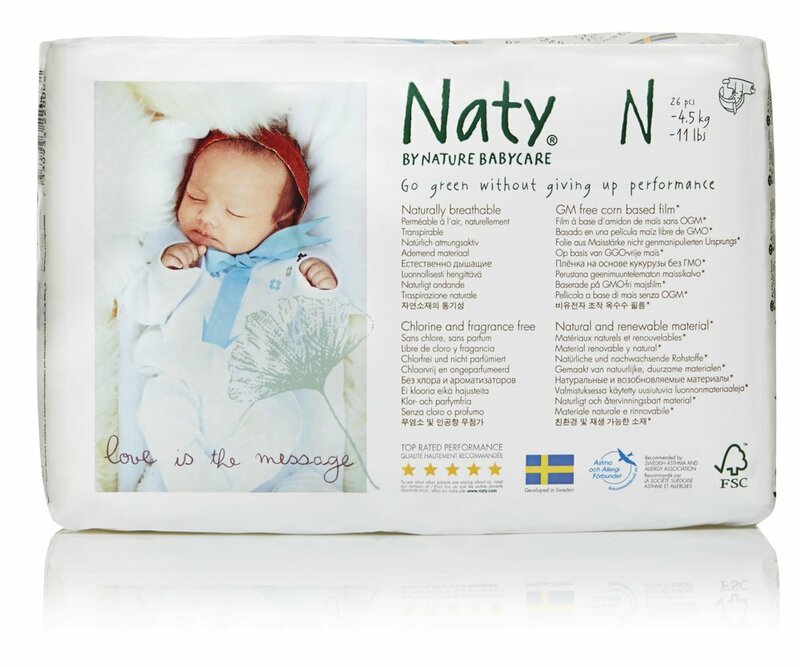 Naty Diapers are certified by the Swedish Society for Nature Conservancy, and are made from more than 60% natural biodegradable materials. Please note that they are made using cornstarch, which can be a potential allergen to the most sensitive of babies. Developed in Sweden and made in Turkey, Naty Diapers are known for being absorbent and having a great fit, but there have been recent reports of defective diapers and leaking after a redesign. The reviews have been mixed, but I myself didn’t experience any of the issues that some parents have reported when I tested out these diapers. A relatively new brand, ABBY & FINN diapers look very promising! They are made with TCF pulp, and contain no chlorine or its derivatives, heavy metals, latex, fragrances, lotions or moisturizers, known allergens, or dyes. When ordering, you have the option to choose multiple sizes and patterns, which is a nice convenience. ABBY & FINN Diaper Ingredients: TCF (totally chlorine free) Wood Pulp from sustainably managed forests, SAP (super absorbent polymer) – Sodium Polyacrylate, Topsheet – extra soft, 100% pp nonwoven, Core wrap, leg cuffs – 100% pp nonwoven, Acquisition Layer – Polyester Fibers, Backsheet – pp fibers and pe film for softness and liquid containment, Leg, Waist and Crotch elastics – polyurethane. Parasol is a relatively new company and their diapers are free of heavy metals, latex, and chlorine (they are TCF). The company uses fluff pulp harvested from sustainably managed forests for absorbency. Parasol diapers have received certifications from several environmental organizations which show its commitment to providing environmentally safe products. Parasol also does not test on animals so you can feel good about that when you’re buying its products. Parasol diapers are manufactured in the Czech Republic. Their diapers are cute and feature designs from emerging artists in the United States. Parasol Diaper Ingredients: Polypropylene non-woven, Super-absorbent Polymer (Sodium Polyacrylate), Wood Pulp (total chlorine-free), Polyethylene Film, Latex-free Hygiene-grade Elastic, Hook and Loop Closing Tabs. You can order a subscription via their website or shop through Amazon. Bambo diapers are a favorite not only because they are super absorbent but because they contain no allergens, perfumes, or harsh chemicals. That means you won’t find any elemental chlorine, formaldehyde, phthalates, PVC, heavy metals, carcinogens, latex, odor inhibitors, lotions, or any other substances that are known to be harmful. Bambo’s breathability is noteworthy, and your baby will still feel dry with a full diaper, which keeps them free of those pesky diaper rashes. 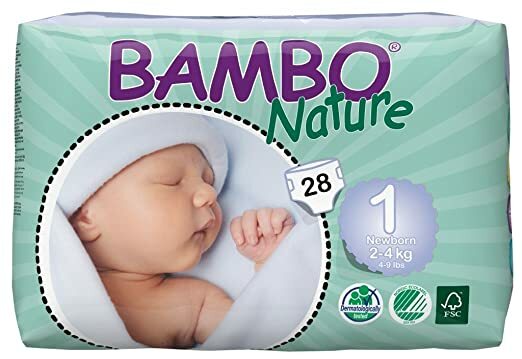 Bambo Nature diapers are made in Denmark. We have used Bambo’s classic (green bag) diapers since my oldest was just a couple of weeks old. I tried a few other brands of total chlorine-free diapers, but none even came close to Bambo in absorbency, comfort, fit, and ingredients. Even with a full overnight diaper, my boys are still dry thanks to the absorbency and breathability. This is also one of the reasons we hardly ever get redness or diaper rashes – your baby’s bottom will stay dry with these diapers. 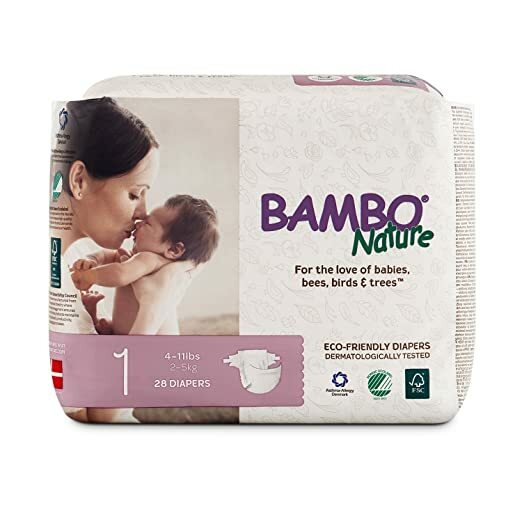 NOTE: Although they market themselves as chlorine-free, and this claim is technically not inaccurate, Bambo Nature diapers are not TCF. They are made with ECF wood pulp, which is disappointing considering the high price of these diapers. They are among the priciest disposable diapers available, so it is difficult to justify the cost when there are TCF diapers available at better price points. On the other hand, I can say with confidence that they are still high quality diapers and my kids have not had any issues with them, despite my second baby having eczema and sensitive skin and the top sheet being made from polypropylene. Bambo Nature Ingredients: Non-woven backsheet (outer side) of polypropylene (PP) and polyethylene (PE). Absorbent of polyacrylate (SAP) and cellulose (ECF fluff). Topsheet of non-woven (PP). Acquisition layer of non-woven (PET/Co-PET). Hook tab fastening system of non-woven (PP/PE). Adhesive made of synthetic rubber—no optical brightener added. Wetness indicator. Elastication made from elastane. Thrive is an online market that sells products made with renewable and sustainable raw materials. Their diapers are no different, given the company’s commitment to using natural materials and avoid petroleum-based materials whenever possible. Besides being better for the environment and safer for your baby, these diapers are also known to be super absorbent so it’s a win-win all around! The best thing about these diapers? Their price. They come in at around 19 cents per diaper, which is pretty amazing for any brand on this list of non-toxic diapers. A few things to know before choosing this brand: the newborn size can run pretty small (so I wouldn’t stock up in advance), and these diapers aren’t as soft as some of the other diapers on this list. They also contain a “plant-based” absorbent core made from GMO corn that I’m not 100% crazy about. Otherwise, they are a great pick for a safer diaper on a budget. Buying non-toxic disposable diapers is definitely an investment in your baby’s health. They can run from 20-50 cents or more per diaper, depending on which brand you buy and where you shop. At the same time, diaper deals on mainstream brands like Huggies and Pampers are nearly everywhere, making it really tempting to forgo your commitment to only using eco-friendly diapers. The great news is that Amazon offers a 20% discount on diapers to Amazon Prime members with its Subscribe & Save program. All you have to do is sign up to be a member of Amazon Prime, join Amazon Family for free, and sign up to receive diapers on a regularly schedule. You can choose delivery dates ranging from 1-6 months, according to your own needs and preferences. We have a 6-pack box of diapers delivered to us each month, and it means that I never run out of diapers! (Or have to keep track of how many I have.) The nice thing is that even as your baby grows in size, you’ll be able to easily change your diaper subscription because Amazon will email you a reminder before sending each shipment. Having your diapers and wipes on auto-ship is one of my favorite tips for new moms. If you aren’t already a member of Amazon Family, sign up for a free 30-day trial today. Investing in non-toxic diapers is one of the most important decisions you can make for your baby. Because of such prolonged use, the risk of exposure to toxic substances from traditional diapers is high and simply not worth the cost savings that you’d get from using mainstream brands. Natural diapers like the ones listed above can run you anywhere from 30 to 60 cents per diaper, but your baby’s health is worth it. Isn’t it better to have peace of mind to know you’re using safer, chlorine-free diapers for your little one? How “green” are Seventh Generation? I know that their other products aren’t as green as they claim just wondering if that is the same for the diapers. In your post, there is an affiliate to BabieB Bamboo diaper instead of the Naty (Buy Now). Do you recommend that brand? Hi Ana, that’s incorrect. Thanks for letting me know. I’ll have that updated! Thank you! Do you recommend 7th generation diapers and wipes? or Earth’s Best TenderCare Chlorine-Free Diapers, Fragrance Free ? Have you looked into the Pampers Pure Protection diapers? These seem to be new from Pampers and be totally chlorine free per their website. They looked great but I didn’t list them because they wouldn’t disclose an ingredient to me (the odor absorbing mineral), citing that it was proprietary. My sense is that they’re probably safe to use but I couldn’t say 100% without knowing all of the materials they use. Which of these come in a pull-up style for potty training? Honest and Bambo have them!